Permanent, all-metal, cleanable, P5 filters are engineered to handle high face velocity air speeds ranging from 400-600 fpm. By comparison, normal velocities are 356 fpm. Without compromising efficiency, the P5 will handle up to 50% more air. This true high-velocity filter is especially applicable where plenum chamber space is limited or where “V” or “U” type filter banks are not practicable. Special construction and materials can be furnished to meet specific applications. The P5 incorporates a unique Turbo-Flow filtering principle. Air chamber are formed by reversing “Z” crimped layers of galvanized wire stacked at 180° to each other, these channels create exceptionally high air turbulence, resulting in a wiping action as the air-entrained dirt impinges on the adhesive coated wire baffles. Enclosing channels are of galvanized steel, or other options (see chart, below). Labyrinthian air passages enable dirt to be deposited over a greater depth in the media, increasing the dirt-holding capacity of the P5. 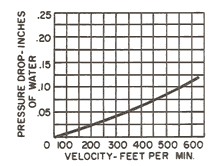 As a result, the static pressure drop is maintained at a relatively low level. Filter efficiency of the P5 is over 70% using standardized test dust methods. Standard sizes are available in 2” thickness. 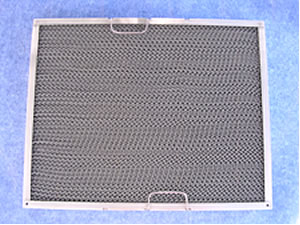 To clean the P5 filter, simply flush with a solution of commercial cleaner and hot water. Dry completely before re- application of adhesive.